Ever get the feeling the majority of the mainstream news stories are manufactured narratives? So do we! Boiler Room is here to encourage everyone to take a deeper look, keep a sense of humor and some semblance of logic and morality when it comes to the mass media cartel toxic dump truck doing their best to push vile dialectics and false narratives. 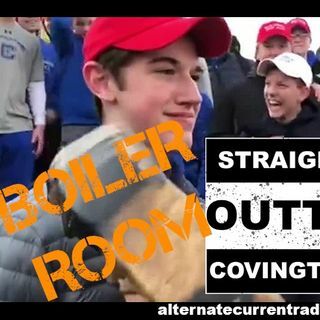 On this episode the Boiler Room is discussing the unavoidable story ... See More of the Covington Catholic School MAGA youths vs. Black Hebrew Israelite provocateurs and a Native American with a less than honorable role in the mainstream narrative of the widely misreported "stand off" at the March for Life demonstration in Washington D.C. Jay Dyer kicks off a great discussion on counter cultures being used to marginalize people involved in it, 60s & 70s drug culture, Tim Leary and the Grateful Dead. The $600,000 annual fee paying transnational, globalist mega-corporations meeting at Davos to conspire on ways to enact carbon taxes, push man made climate change narratives, "meat taxes" and pushing people away from small farms and protein based diets. All this and much more. Enjoy the show!